The pungent black cardamom spice (amomum) is native to India, and somewhat surprisingly, a member of the ginger family (zingiberaceae). The delicate plant is where you'll find the pods which are still picked and sorted by hand. These pods are then dried over open flames which gives rise to its unique smoky aroma and flavour. People have been using and harvesting it this way for thousands of years, and there are records dating the use to at least 4000 years ago! 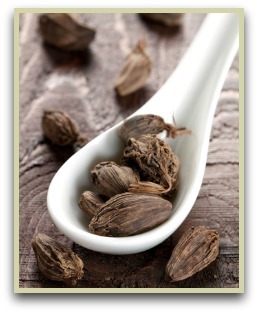 Click here to read more about the interesting history of cardamom. The tough pods are dark brown, hairy and can vary in length from 2-5 cm, and inside you'll find the seeds, usually between 20 and 30 sticky seeds in each pod. It's these tiny seeds that you use in your recipes. 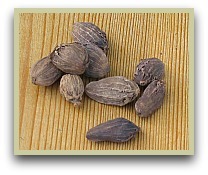 When cooking with black cardamom there are various ways of using them. You can crack them open and add the seeds to your cooking as they are or, if making blends and mixes, get out your pestle and mortar or coffee grinder and grind them to a fine powder before combining with other ingredients. These ground seeds are essential for making various garam masala recipes and other mixes like the complex Moroccan blend ras el hanout. Note: don't buy the pre-ground powder! As the seeds quickly lose their pungency, it's better to buy whole pods, extract the seeds and toast and grind them yourself whilst actually preparing the dish. The freshness and flavour are so much better than commercial pre-ground powder. If making a stew or curry you can throw the pods in whole and this will lightly flavour your food. Or crack them open first and the seeds will dissolve in the heat leaving the empty husks. But remember, if you don't want a chewy surprise, don't forget to remove these husks or unopened pods after cooking! Read more general info about the different types. ...Green cardamom pods are considered a "cooling spice" and used in lighter dishes and drinks like tea and Turkish coffee. It can even be used to make ice cream! Whereas black is a "heating spice" and goes well with more robust Indian dishes such as kormas, meat, rice and vegetable dishes. Winged Cardamom, Nepal, Hill, Brown and Bengal Cardamom. There are others but these are the variations I have come across.